Nanaimo-Info-blog: A New/Old Public Square? A new public square downtown? After attending the Remembrance Day service on Tuesday at the Cenotaph I ran into Ian Niamath who said he was starting a new campaign that day on that spot. It seemed like a pretty simple and sensible idea to reclaim a piece of downtown sacrificed to the automobile and return to the people. 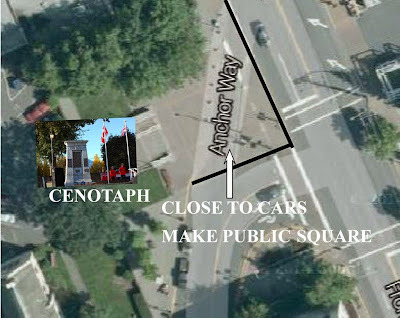 The graphic above, simply illustrates what I believe Ians' plan is, and that is to close off the vehicle access which comes through Anchor Way and make the whole area in front of the Cenotaph into a 'people only' zone which creates a nice public square. Cars needing to go onto Church St. from Front Street could simply use the lighted intersection instead of taking the shortcut through what would now be public square. Whether Ian is serious enough about the idea to pursue it with the powers at city hall, only time will tell, but to this simple scribe it does seem like a worthwhile endeavour. What do you think? Cars or people? As a courier that works mostly downtown, I use the Anchor Way shortcut 4 or 5 times a day. I would hate to see this closed for a "square" that would see practical use 1 day a year. Check out Diana Krall Plaza, a hop, skip and a jump away. Its designated purpose is a public square and it sits empty 95% of the year. Sorry, gotta go with "cars" on this one. We have enough traffic restrictions in this city, too many "no left turns" and hardly any dedicated right turn lanes. There is way too much wasted time and fuel due to these silly restrictions. For example, traffic sits backed up for blocks, daily, on Bowen Rd northeast and the Island Hwy as there is no right turn lane for traffic heading south on the Island Hwy (beside the Chevy dealer). There are many examples like this in town. Another is westbound Rutherford Rd and the Island Hwy. The light is super short and traffic backs up quickly. There is no right turn lane to head north on the Hwy, so if you miss the light, you sit and WAIT for 3 or 4 mins. It's ridiculous when all the land is just sitting there. Carve a lane into it and get traffic flowing. There are 2 left turn lanes at both these locations but no right turn lane. Wake up, traffic planners. I think that this would be an excellent change, as it gives more space for those visiting the cenotaph to pay their respects. As for individuals experiencing congestion downtown, I would argue that the entire layout of the downtown makes commuting next to near impossible. Also with the lack of affordable, downtown housing options, people have to commute, and park their vehicles, etc. When I was walking the boardwalk, there was a couple with their child looking at the few townhouses and condos that were available and their words were, "yes it would make sense, but its way out of our price range". I'm guessing that is the mantra of most nanaimians looking for affordable downtown living, but I digress. Someone needs to look at the downtown and have some serious discussions with a city planner because these are issues that are only going to get worse as the population grows. Some streets need widening, some need new exits, some need to be created where there are none currently, and some need to be removed altogether. As I look at it, I think that you should remove anchor way, and even reclaim the parking-lot behind the cenotaph as public space. It may add another couple minutes to your day, but this is supposed to be an area to be dedicated to people who gave their lives for us, the very least we can do is give them space. I'm sure that the inconvenience that you will feel is far less than the sacrifice these people made. Me again, to further support this idea of taking anchor way and even the parking lot behind it, look at the people in the picture of the cenotaph. They are literally in the street and trying to participate by peering over the fence. This space needs to be fixed so that next year this is not the case. Move the cenotaph to Diana Krall Plaza. Much more room for assembly and zero impact on vehicle traffic. Problem solved. Considering that it's only needed for the public once per year, I can't see the need to close it off. It certainly should be closed on Remembrance Day, but then the whole area is closed to vehicle traffic, is it not? Move it to Diana Krall Plaza! I own a store on the top of Commercial Street and I get deliveries weekly and these couriers are suffering enough with general public abusing the "commercial only" spaces just to run into the bank or to get a coffee or green smoothie. I watch them doing circles around the blocks until the jerk that sits there finally moves. So its not minutes out of their way, it can actually be a half hour of running time of exhaust and wasted gas at premium prices. Its ridiculous to cut off the quick way in. Move it to a huge space that is never used. The only time Diana Krall plaza is used is during the friday evening market that just started this year and for random gatherings. Its vacant and boring and just a big cement square the rest of the year. The DNBIA doesn't do anything there to pretty it up or to make it an exciting place to go all year long. Put the memoral there and flower the place up a bit and maybe light it for the evenings. I would absolutely vote for this change. Makes complete sense. And then theycan maybe focus some of that energy on the mess the city has made of the parking downtown. Cost is $78 per month to park at Bastion Street Parkade and thats the cheap location, the others are much more expensive. Now there is something we should be bitching about and working together to fix.